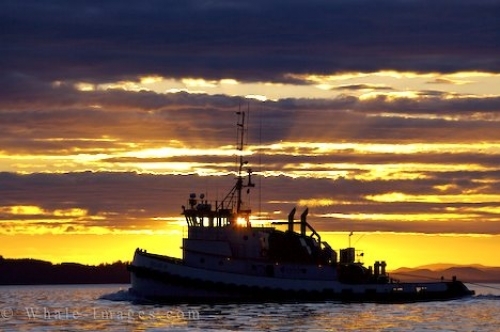 A stunning sunset over the serene waters off Northern Vancouver Island in British Columbia as a commercial fishing boat heads home for the day. The clouds thicken above the ocean off Northern Vancouver Island in British Columbia, Canada as a commercial fishing boat travels at sunset. The sky is aglow in bright yellow hues and filters through the dark patches of clouds just before the sun disappears over the horizon. The tranquility around these waters during the sunset hours is unbelievable with only the sounds of the engine and the rippling water being heard. On some evenings, the silence can be broken as a pod of Killer Whales pass by in the sunset lighting. The commercial fishermen have spent long days on these waters fishing for salmon which frequent these waters on their spawning routes. Trollers are seen the most in the waters off Northern Vancouver Island as this a common method used for fishermen. Some of these commercial fishing boats are up to 60 feet in length with tall poles on either side of their masts at midship. When fishing, the poles are dropped so they are at about a 45 degree angle and other vessels should give the trollers plenty of room when passing. When the sunset hours come about, many commercial fishermen call it a day, often anchoring along the coastal shores when the fishing grounds are at their peak. The days and nights of a fishermen can be very long and tedious, but the spectacular sunsets they encounter are what makes each day worthwhile.